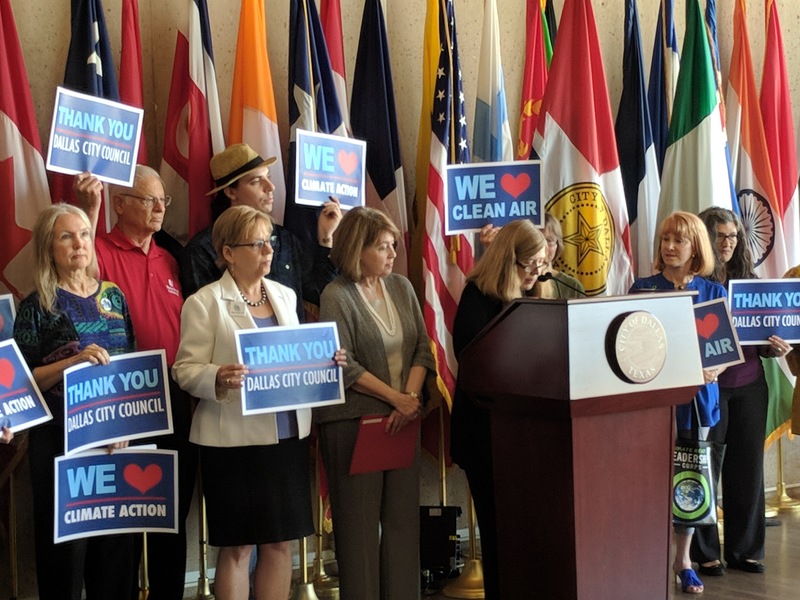 On Tuesday, September 17, the Dallas City Council passed its new biennium budget, funding an environmental plan with the development of a climate plan. The historic vote was marked by a press conference with ten environmental and health groups and Council Member Sandy Greyson, who fostered the $500,000 budget amendment for the plan. The Office of Environmental Quality, that will oversee the climate planning process, also participated in the press event. Dallas Mayor Mike Rawlings signed onto the Mayors National Climate Action Agenda in June 2017, which was formed after the United States withdrew from the Paris Climate Agreement and commits cities to the goals of the Paris accord. A total of five cities in Texashave signed the Mayors’ Climate letter. Austin passed a climate plan in 2015. San Antonioisdeveloping a climate plan now, while Houston has just initiated its planning process. San Marcos and Smithville have also signed onto the Mayor’s Agreement. More cities in Texas, both large and small, need to step up to the plate and do what they can to reduce their carbon footprint. When an area reduces its dependence on fossil fuels, it can also be beneficial to improving overall air quality in regard to volatile organic compounds (VOCs) and nitrogen oxides (NOx), both major components of ozone. In Dallas, 1 in 10 children suffer from asthma, costing Dallas County more than $60 million annually, yes annually, in direct and indirect costs. Clearing the air can only help improve the health and vitality of all our communities. The U.S. is the only country worldwide that is not part of the Paris Climate Agreement, after the current Trump Administration pulled out of its commitment. As a result, the Mayors Climate Coalition was formed, with more than 400 Mayors representing 70 million Americans dedicated to taking action to reduce their communities’ carbon footprint. So I urge citizens to band together, to talk to their City Councils, and ask their municipalities to join the Mayors Climate Coalition. Now that Dallas has stepped up to begin its climate planning process, it is my hope that neighboring Ft. Worth and other cities around the state, will take on the challenge, for the health and welfare of their communities. For more than fifteen years, Rita Beving has been a volunteer and professional advocate on environmental issues including air, water, and landfill in North and East Texas coordinating with numerous environmental groups across the state. Currently, she serves as a consultant for Public Citizen on clean energy and eminent domain work in North Texas. Rita conducts ongoing monthly clean air meetings to educate the public on energy efficiency, PACE renewable energy districts, and other clean air issues in North Texas.